Social media is enraged at Careem and boycotting the popular ride-hailing service in Pakistan. 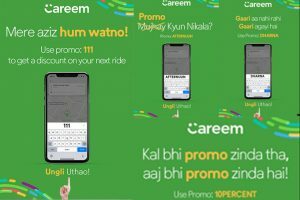 Netizens in Pakistan are boycotting and uninstalling the Careem app over the politically motivated messages and promos it is sending to its users. The Middle-East ride-hailing service Careem recently started a political campaign by sending promo code using slogans of famous political leaders in Pakistan. It seems like not only political parties are concerned over their win in upcoming elections in Pakistan but Careem is not anyway behind in capitalizing the current political situation. Politics and political discussion are a huge thing in Pakistan. It is discussed at gatherings, coffee shops, libraries and even weddings. Now that the Elections of 2018 are just around the corner, it is not a surprise that brands in Pakistan would want to capitalize on this hot topic to lure the users into using their service. Careem is also not behind. The company is popular for capitalizing the social trends to their advantage and this time too they are doing it. But, apparently, their marketing team messed up this time. Harmless looking political slogans which they introduced to be more relevant for their userbase, divided their users for their respective parties. When Careem introduced the slogan ‘Mujhay Kyun Nikala’ it offended the N-league supporters and when it introduced ‘Dekho Dekho kon aya? Captain, Captain’, non-PTI supporters were upset — that’s why organizations should be apolitical. But people do not seem to like the way Careem incited its users to use the service and now it is in deep trouble. A hashtag #BoycottCareemPakistan is picking up on Twitter and people are totally enraged. Why are you sending me your anti-democracy campaign messages to me, despite the fact I have stopped using #Careem and uninstalled #Careem. People did not expect this from Careem. People see it as a threat to National unity. Bicott #Careem service for a cheap things, I don’t believe that why they are working for one Party or Side !These types of things are also dangerous for our Nation Unity ! People feel their sentiments are being hurt. Many people are considering it a plot against a transparent democratic election process in Pakistan. Careem ever since has apologized in one of its Tweet and said that they did not aim to hurt the sentiments of people and are sorry if someone is hurt. England’s injured fast bowlers: how badly and how long?